Winemaker Clarissa Nagy was kind enough to send me a complete package of her current releases. I immediately fell in love with the tenacity of her Viognier. I was bowled over by the voluptuous fruits in her Syrah. So I absolutely expected good things when I opened Nagy Wines 2012 Pinot Noir. But “good things” does not adequately describe the drinking experience. “Exceeds expectations,” still doesn’t do the wine justice. I may, my friends, be at a loss for words to describe just how well-balanced, refined, and, well, just plain tasty this Central Coast Pinot Noir is. About the Wine: Nagy Wines 2012 Pinot Noir is made from 100% Pinot Noir grapes harvested from GArey Ranch Vineyard in the Santa Maria Valley of Santa Barbara County. Here, the soil consists of an interesting mixture of sand and loam, the combination of which means that the vines don’t have to work too hard, resulting in fairly small, but flavor-dense, buds. Grapes were gathered with 20% whole cluster and 80% destemmed then left to cold soak for 5 days with a single daily punchdown until cap was formed, after which rack and return was performed. According to Clarissa’s notes, this rack and return reduced the wine from 21 Brix to 7 Brix. After going through another series of single daily punchdowns, the wine was pressed at dryness and then set to barrel age in 100% French oak (30% New) for 18 months. The wine then aged in bottle for 1 year before release. Flavor Profile: I know I said I’m struggling for words to describe Nagy Wines 2012 Pinot Noir, but I’m going to do my best to try. Immediately after you pop the cork, a beautiful array of aromas gently waft out of the bottle — nothing distinct yet, just a light puff of perfume. In the glass, the wine is a dusty rose color — you can see through it, but there’s a hazy aura. Breathe in the wine. It’s like rose petals right after the rain — a light pink floral aroma complemented by dewy droplets. The first sip is just…refreshing. So take a second sip and follow the journey this Pinot Noir will take you on. You’ll start on the plush pink petal of the rose. And, like that rain droplet, you’ll roll off the petal and on to the garden floor where a cranberry bush has shed its fruit. They’ve just turned ripe — they still have a youthful vibrancy against the concentration of fruit flavor. But don’t forget you’re on the garden floor. Keep your lips shut tight, keep the wine on your tongue, and take a breath out of your nose and get an earthy background aroma, reminiscent of cocoa bean, nutmeg, a hint of clove. The tannins come in just towards the end of the mid-palate — they are soft, but full, and gently lead you towards a clearing, a grassy knoll. Indeed, the finish speaks of green, vegetation. And here you can lay, and relax, and be peaceful. Food Pairing: Simply pan-seared salmon (med-rare) atop an herb and strawberry salad. Keep it simple. Keep it lively. Let the wine be the star of this meal. More Info: It’s no secret that I love this wine. It’s aromas, tastes, and textures are reminiscent of some of the finest Bourgogne out there. Typical California Pinot Noirs are bred and bottled to drink and enjoy straight-away. And Nagy Wines 2012 Pinot Noir (obviously) is one thousand percent beautiful today. So if you have a bottle, drink it. Drink it now. Do it. And riddle me this, Batman: do you see, smell, taste how this wine could blossom from one rose petal to a whole bush? So the only answer has to be — get more than one bottle. Get several. Enjoy it from year to year and mark its progression and development. See how that garden can grow. Clarissa, you are a legend. Readers, if you haven’t yet seen my reviews for her Viognier and Syrah, please click those links and see what else this woman can do. I received the Nagy Wines 2012 Pinot Noir as a sample for review. (Cheers, Clarissa!) 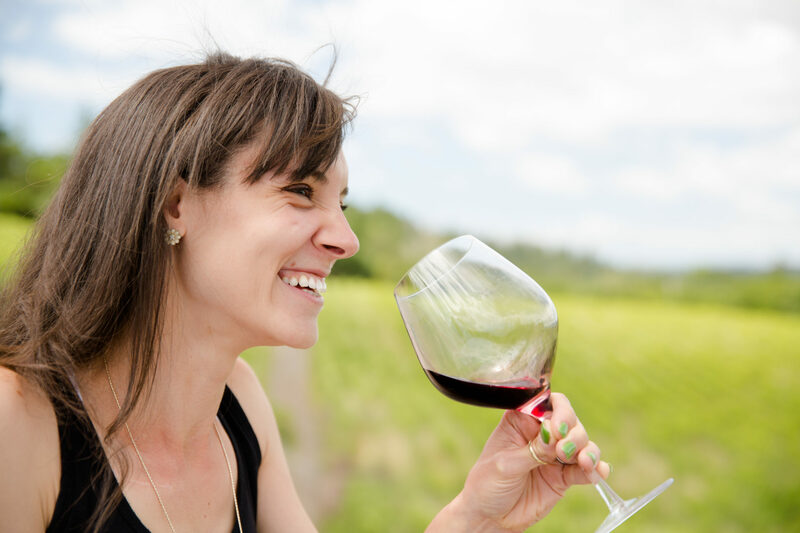 For more information about this woman in wine, and to purchase wine directly, please visit the Nagy Wines website. AWESOME! Happy to see another member of “Team Nagy”!!! You know the trouble with reading posts like this? I want that wine. Sounds delish! She sells online — if you’re in CA in shouldn’t be a problem. I highly recommend, if you’re going to buy just one of her wines — this is the one to have. If you’re looking for a white, then the Viognier.